If you visit Thailand and get a chance to go to an open air market, you might see beef jerky being made -- drying on a flat bamboo tray. While the ingredients are the same, the steps below differ from what people really do in Thailand: in Thailand, the beef is sun dried. However the jerky tastes just about the same. This is a very simple dish that you can make as a big batch and freeze for later. When you eat it, like with western beef jerky, you pull the strands apart. There is another Thai version with honey, dark soy, fish sauce and coriander called heavenly beef, sweet meat or sweet meat jerky. The steps are the same. When this is served as part of a meal, it is either served with sticky rice and a number of other dishes. As a snack, it is just served with sticky rice. Either get very thin steaks or a roast from the butcher. Recently I have started asking my butcher to slice them thin for me. Slice the beef into thin, flat steaks 1/4 of an inch thick with the grain of the meat. 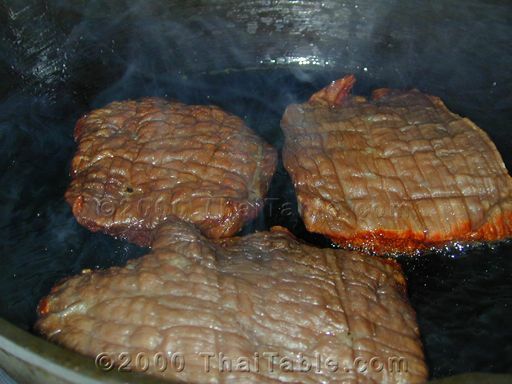 Cut the sliced beef into rectangles about 3 inches by 4 inches. 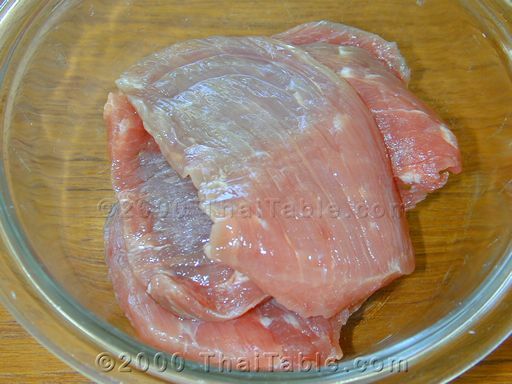 Sprinkle salt on each piece and marinade for at least half an hour. Turn on oven to bake the lowest temperature you can get. It is 170 degrees on my gas oven. 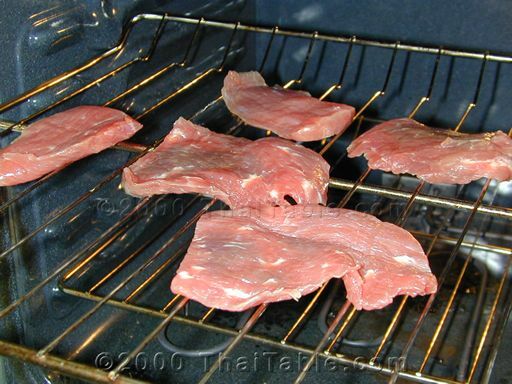 I found gas oven to give me better result than an electric one for beef jerky. Use the highest rack to keep the beef from cooking. Lay the beef on the rack with ample room between the pieces. Keep the oven door ajar the whole time to let the air circulate. It should take about 1 to 1 1/2 hour. The beef jerky should feel dry on the outside but somewhat soft when you press it. 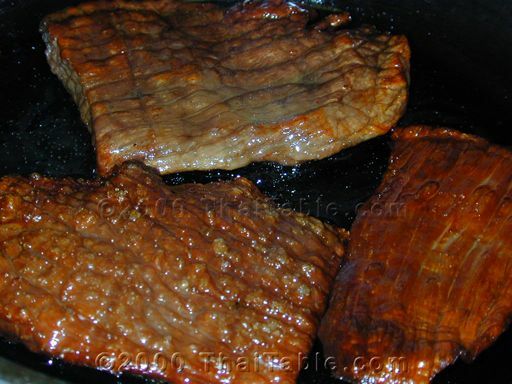 Drying the beef longer than an hour will result in dryer beef that splatters less when fried. 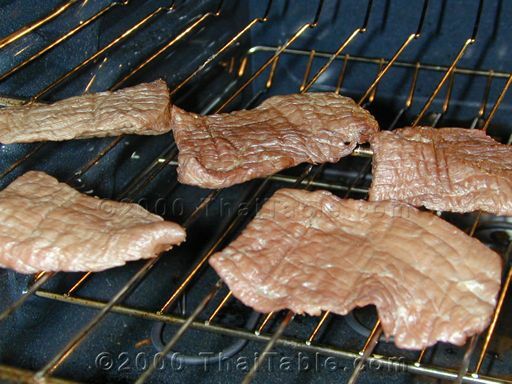 Uncooked beef jerky can be frozen and pan-fried directly from the freezer. 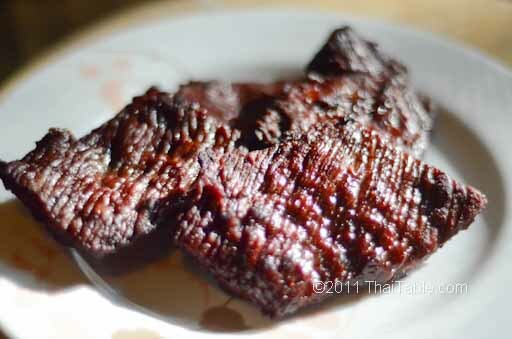 Pan fry the beef jerky and serve with regular rice or sticky rice.